The extensive lowlands around The Wash are drained by over 1,000 miles of waterways varying in size from tiny field drains to canalized rivers. These man-made waterways are straight and of uniform depth, and at first sight offer no clue to the whereabouts of fish. To read these featureless waters, you must first decide roughly where the various species of fish are to be found. Second, you must look in detail for signs of their exact location. Third, you must decide at what depth or position in a particular swim the fish may habitually feed. Know the spawning areas In deciding the probable whereabouts of species, it is most important to know the spawning area of 304 the fish. On fen waters, these are usually small offshoots of the main drains – perhaps a short distance downstream if a pumping station. Above all, they are always considerably shallower than the main drain where the fish live and feed. In them, weed growth is early and vigorous and the temperature rises more quickly so that the fish ripen rapidly. Specimen fish may result. All the main species of fenland fish use exactly the same spawning areas but occupy them at different times of the year. During the first few days of March, pike mass near the entrance to them, then move in to spawn during the early weeks of the close season. By early June, they have returned to the main drains. Bream then use this area to spawn. By the opening weeks of the season, 305 massive shoals of spent bream can be expected near the entrances. They usually shoal near to the spawning areas for about four weeks and then begin to move up and down the main waterways until winter when they make for the deepest areas of the drains. 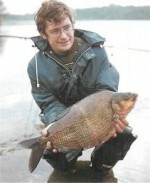 Tench, rudd, roach, and perch use the small-drain spawning areas too, but to a lesser extent than pike and bream. The diagrams illustrate a typical stretch of a fenland drain with a shallower spawning drain, and the way fish move about. According to the time of year. These movements depend to a large extent upon prevailing weather conditions. In a late spring, the weather warms up more slowly and fish spawn later than normal. The dates given repre-sent an average year. Having decided which swim offers the best chance of fish, it is necessary to deduce just where fish are lying within that swim. Although a stretch may seem featureless, certain pronounced underwater features are common to most fen drains. The method of dredging these waters results in a deep central channel, and a shallower shelf run-ning below each bank. Weeds grow on these shallower shelves, and gaps in these weeds and the sudden drop from a shelf to the bottom of the central channel can be productive spots. Rudd and tench prefer the shallow marginal shelf during the summer, the rudd feeding just below the surface, and the tench rooting about on the shelf. Roach can be expected throughout the year roughly where the deeper central channel begins. Pike lurk in the weeds on the edge of the shelf or work their way along the drop-off, waiting for their prey to swim above them. The first clue to feeding fish-especially tench, bream, and roach – is the colour of the water. By rooting about on the bottom, these fish stir up the mud and discolour the water. Long stretches of any fenland drain show little colour in summer, but every so often there is a coloured patch, perhaps 500 yards long. This almost certainly indicates a bream shoal. Tench usually stir up the bottom over a much smaller area, and such discoloration as they make does not last long. Roach are seldom shoaled tight enough in summer to cause anything much more than minor discoloration. Looking for coloured water is only useful in the summer. In winter the drains are flowing and the beds will have been disturbed by the action of the pumps. One of the best ways to locate a bream shoal is to watch weekend angling matches. You may walk along behind 30 or 40 match anglers then suddenly come across five or six, their rods bending, who have struck into a shoal. Bream seldom move about quickly and you can ex-308 pect the shoal to stay within a few yards of the spot for several days. Alternatively get to the water at dawn. On any fen water, a few bream will almost always be rolling over in the waves, marking the position of a shoal. Having found bream, you will then be able to find tench and roach too. Bream, rooting about on the bottom, stir up snails and other animals, and tench move in to feed on them. After bream have moved on, roach will join the tench. Rudd, however, move out of an area whenever a bream shoal moves in. They tend to concentrate on clear-water areas where they are easily located. Throw out a few crusts of bread, to float on the surface over several square yards of the drain, especially near any weedy areas. If small rudd are present they will soon start to punt the crusts about, and bigger fish, in the manner of carp, will investigate them. Tench love weed, the amphibious bistort in particular, and if beds of this are loc-ated, tench are certain to be there. Bistort spreads tree-like underwater and tench feed in its shelter. Pike are difficult to observe except in early spring, when they gather to spawn. For the rest of the year they are spread fairly evenly throughout the drains. Nevertheless, pike hotspots do exist. Almost all the big pike in any two-mile stretch usually concentrate in a hotspot of perhaps 50 yards. Nobody knows why, nor do these hotspots coincide with any discernible features. The only sure way to locate them is for several anglers to work their way along a drain, noting accurately where the big fish are taken. Fenland drains teem with fish, so that even if a beginner’s location of fish is haphazard, he can still catch a few good fish. However, if you know the basic principles of reading fen waters, the fish will be located more consistently, and your results will begin to improve enormously.